A month ago we were celebrating Commonwealth Bank’s new Group Environment Policy committing the bank to the goal of limiting global warming to less than two degrees. For a moment, it looked like Commbank really got the issue of climate change and were even sticking their necks out in front of the other banks, talking about the need to reduce dependence on fossil fuels and acknowledging the role they had to play in helping the world meet this goal. Then, the bank’s head of institutional lending and markets, Kelly Bayer Rosmarin, said in the media that she didn’t see Australia’s banks following the lead of those in France, committing to end finance to the coal sector. That’s a pretty bold statement to make by one bank about its rivals but if anything, says more about Commbank’s dirty intentions than the other banks. Like a pin to a balloon, the dream of Commonwealth Bank turning their two degree commitment into practical action burst then and there. 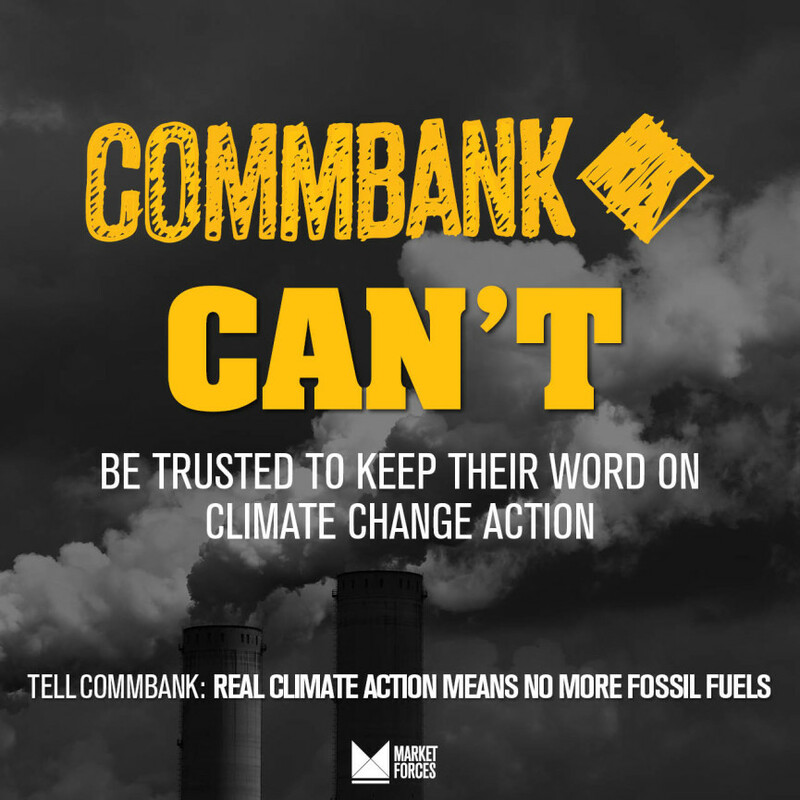 The positive sentiment and hope from Commbank’s new environment policy didn’t even survive through the Paris climate change negotiations. Even after that, we thought it would only be fair to give the bank a chance to work out what this commitment meant to their energy and resources investments. But not now. Commbank are clearly just as happy to finance coal, even juxtaposing themselves against other international banks that have put policies in place to restrict coal exposure. It’s a worry to see bankers struggle with the concept of a budget but we really can’t ignore the fact that dealing with climate change means strictly limiting carbon emissions. Keeping global warming to less than two degrees means around 80% of the world’s known fossil fuel reserves can’t be burned. To that end, policy to operate in line with a two degree warming limit must carry with it an inherent commitment not to help expand the fossil fuel industry at all – let alone provide finance to new coal projects. Burning fossil fuels to produce energy is the biggest contributor to carbon emissions, and the world needs to quickly move away from coal – the most polluting of all energy sources – if we are to have any chance of avoiding catastrophic climate change. Click here to read more about what committing to a two degree global warming limit means for the big banks. So far this year we have seen some of the world’s biggest lenders to the coal sector announce policies to either reduce their exposure to coal mining over time, or exclude coal mining and other parts of the industry for future loans. Not just the French banks that Commbank’s Ms Rosmarin referred to, but Bank of America, ING, Morgan Stanley, Citigroup and Wells Fargo. These measures along don’t constitute a comprehensive response by a bank working to to contain climate change, but after Commonwealth and others committed themselves to the two degree limit, it is the least we could have expected from them. Yet they all but rule out restrictions to coal finance. Commonwealth Bank’s commitment to keep global warming to below two degrees is greenwash until demonstrated otherwise. 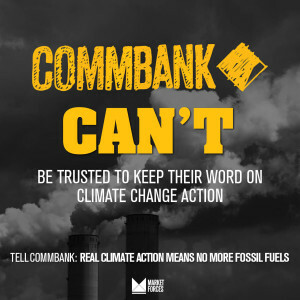 And as for all those customers out there with Commbank, it’s time to move your money to a more ethical financial institution – one that won’t placate you with greenwashing rhetoric before jumping back on the dirty coal bandwagon. and they’re using it to fund fossil fuels, showing no intent of slowing down.